It's no secret that the little black dress has entered the fashion lexicon as a fail-safe, versatile and timeless garment which became as one of the wardrobe's essential in no time. Truly, Black has always been a meaningful color, rich in symbolism; and as per the research, already since the early 18th century, black color in clothing represented romance and artistry. Sounds exciting, right?! Well, unapologetically, Black is poetic. Like, how do you imagine a poet? In a bright yellow jacket? Probably not! So yes, black is classic, which instinctively makes the LBD quintessential. In the last last few months I've shopped crazily from SHEIN.IN, because I just love how they've improved on their products, their purchases and prices, and the delivery. 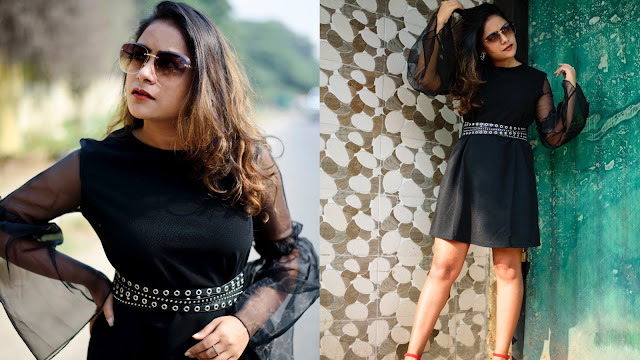 A recent instance was when I'd been looking for a black dress that's not the usual LBD but something that has an attractive element to it, and I stumbled upon this elegant looking piece with frilled sleeves and mesh detail. It's a plain black polyester dress but the long, fuller looking sleeves add a touch of drama to it! 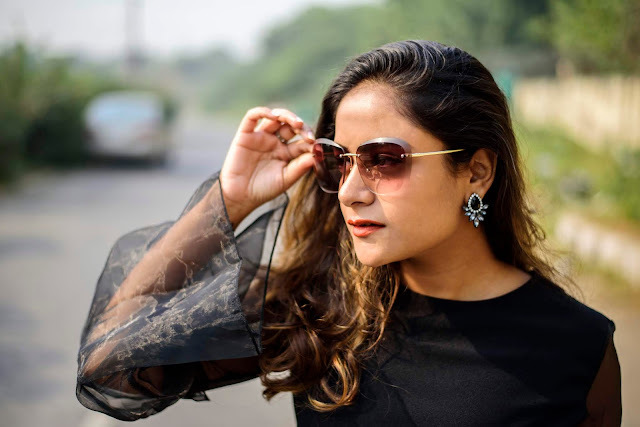 I chose to dress up top-to-toe from SHEIN this time, where I teamed up my ready-to-wear staple of late afternoon and cocktail hours with a pair of oversized sunnies inspired by Kim Kardashian's choices, making my look appear a bit more startling. Also added black rhinestone studs to give it a hint of glamour, along with a pair of bright red, suede heels. And, and..the last minute addition of the embellished belt was a super decision, what do you think? If you're looking for something not-too-chic-but-chic for evening parties this season, this look can be your pick! Do comment below if you liked this post, also share it ahead more ladies. Until next..love & luck.